The kit includes our gamer:bit carrier board for the micro:bit, which gives you access to a number of pins through the form of buttons in a classic game controller layout. But, that isn't all! It's one thing to design a "game controller," but what about building a console? A joystick, buttons to mash...the things that make us hard-core arcade fans drool and daydream. This kit is designed for you! 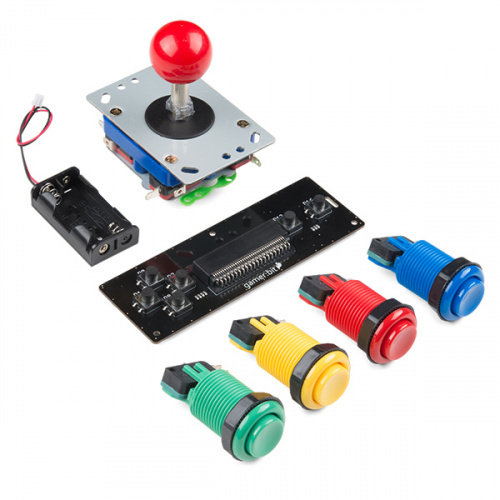 The kit includes all of the parts you need to take this lowly controller breakout to a pinball wizard's dream! Below is all the parts included in the SparkFun micro:arcade kit. SparkFun gamer:bit --- The carrier board for the micro:bit that turns it into a handheld controller, game or other tool. Arcade Joystick --- Old-school arcade joystick that uses digital switched for directions. Red Concave Button --- Mash away! Blue Concave Button --- Jump! Yellow Concave Button --- Game over! Green Concave Button --- For firin' the laser! We wanted to note that this guide is designed to get you started with the gamer:bit board and the SparkFun micro:arcade kit in a straightforward and simple way. We demonstrate each component's functionality and the corresponding code to make it work. While you explore this guide, we urge you to take your time and tinker with the sensors, code and the ideas shared to build something tailored to your application and creativity. Our goal is to get you enough information and know-how to make you dangerous and then release you into the wild.